A web API is just an application programming interface (API) over the web (that is, HTTP). When the resources of an application can be manipulated over HTTP using the standard HTTP methods of GET, POST, PUT, and DELETE, you can say that the application supports a web API for other applications to use. Because HTTP is platform-agnostic, HTTP services can be consumed by disparate devices across different platforms. A central concept of HTTP services is the existence of resources that can be identified through a uniform resource identifier (URI). If you equate resources to nouns, then actions on a resource can be equated to verbs and are represented by the HTTP methods such as GET, POST, PUT, and DELETE. For an application that deals with the Users of an organization, each User is a resource the application deals with. Let us see how an User’s details can be retrieved with an HTTP service. The URI is http://server<port>/API/Users/1000. It includes the User ID and serves as an identifier to the resource, which is an User in this case. Actions on this resource are accomplished through the HTTP verbs. To get the details of an User, you will perform an HTTP GET on the URIhttp://server<port>/API/Users/1000. To update this User, the request will be an HTTP PUT on the same URI. Similarly, to delete this User, the request will be an HTTP DELETE request, again on the same URI. To create a new User, the request will be an HTTP POST to the URI without any identifier (http://server<port>/API/Users). Let us do something practical here. you will create a simple web API that basically exposes an in-memory List<User> over HTTP, for a client application to manipulate the list members. 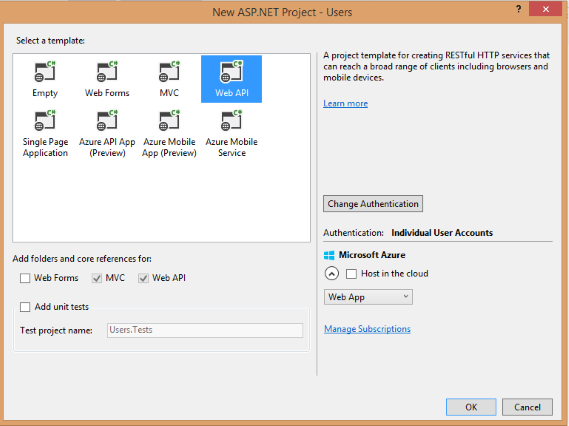 I know this is just limited or small concept but i am sure this will give you clear concept about what webAPI is and how to use it or will give you understanding how to use the ASP.NET Web API framework to build your web API. 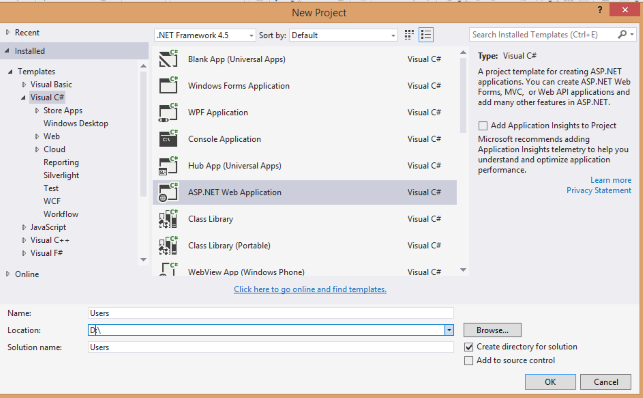 Run Visual Studio and create a new project like shown below Give the project a name of Users and click OK, as shown in Figure 1-1. Select the ASP.NET Web template and click OK. You will see lots of option, as shown in Figure 1-2. 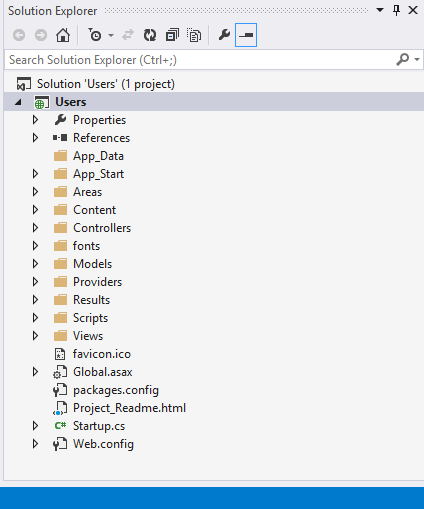 Choose the Controllers folder in the Solution Explorer of Visual Studio. Select Add ➤ Controller and give a name of UsersController for the controller. Leave the option Empty API Controller selected in the Template dropdown and click Add, as shown in Figure 1-3. 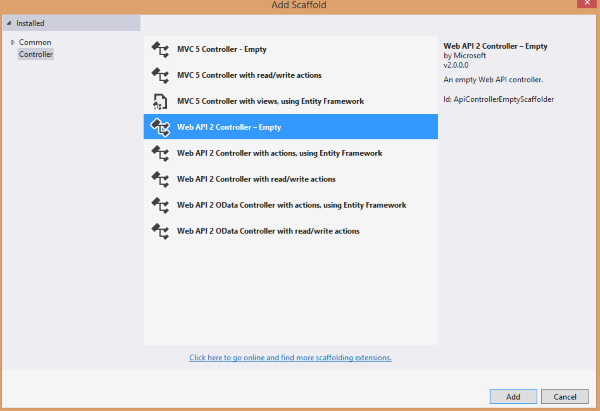 Notice that the generated controller class inherits from ApiController, a class that is part of the ASP.NET Web API framework. 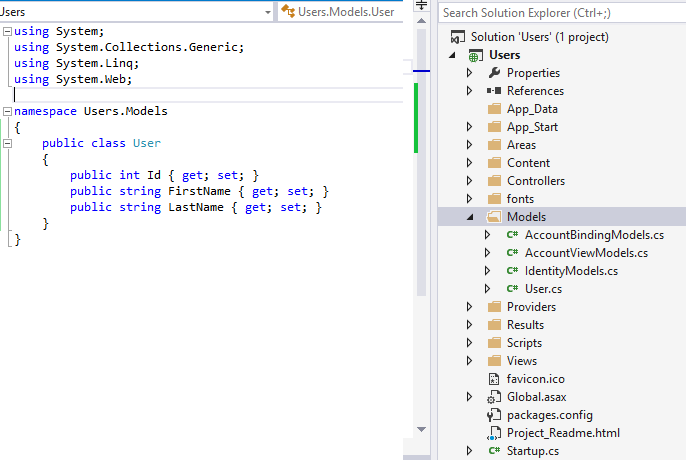 Note: Since you used the User class, which is in a different namespace than HelloWebApi.Models in the controller class, you will need to add a using directive. In Visual Studio, the User references in the preceding code will have a wavy underline in red; right-click any of them and select Resolve ➤ using HelloWebApi.Models. This will add the necessary directive. This is a standard procedure and I will not repeat this step in later exercises, for the sake of brevity. In the address bar type http://localhost:<port>/api/Users Replace <port> with the actual port your application runs on. Note:As you work through the exercises in this book, you will create several new projects, and the port will change every time you create a new ASP.NET MVC project. Remember to replace the port specified in the example code with your application’s actual port. When Internet Explorer asks if you want to open or save, click Open and choose Notepad as the program to open the file. Notepad will display JSON as shown in Listing 1-6. I have formatted the output for your reading pleasure. You can also get the details of a specific User by performing an HTTP GET on http://localhost:63482/Api/Users/1000. In this case, you get the JSON output shown in Listing 1-7. If you see the preceding two JSON outputs, you have just created your first web API and exposed the in-memory list of Users to the outside world over HTTP! Currently, we have tested only the HTTP GET but we will test the other methods in the upcoming exercises.